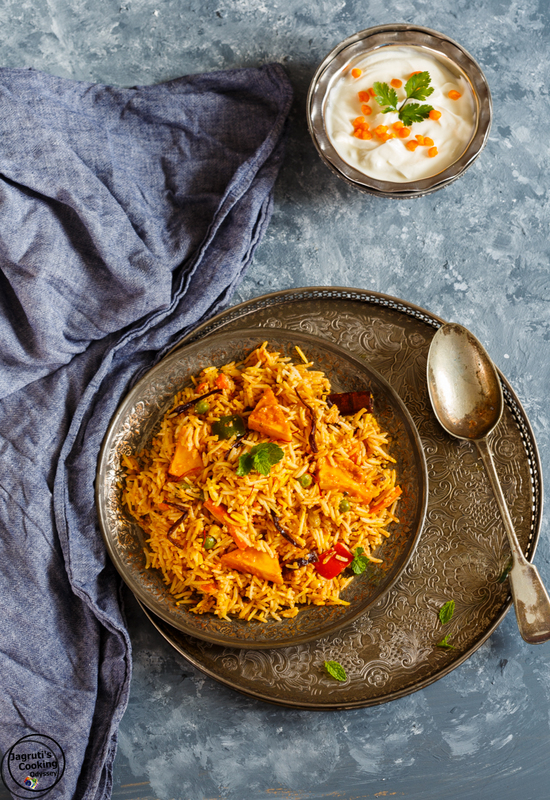 This Indian classic Paneer and Vegetable Makhni Dum Biryani, is bursting with royal flavours. It is a treat to eat this scrumptious and exotic Biryani, no wonder my kids call it 'Taj Mahal' Biryani!! All the aromatic and sweet spices, rich nuts and fats make the dish gratifyingly regal, as well as tasting exquisite. 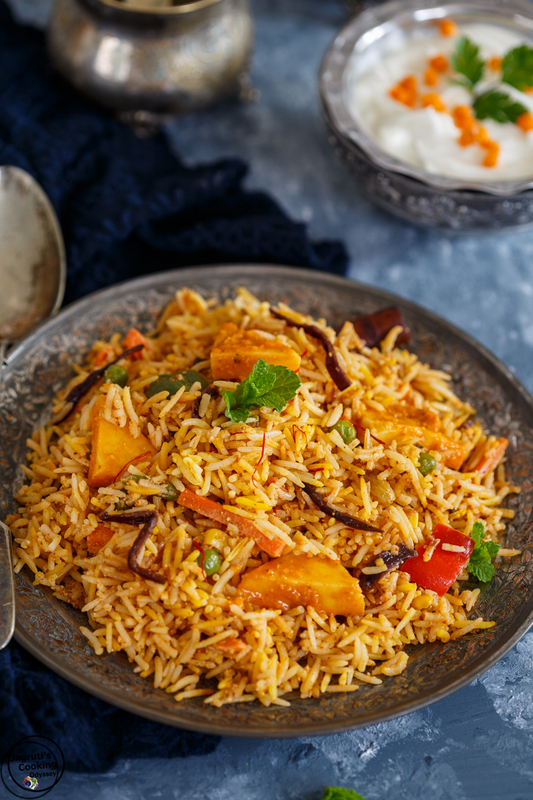 Biryani is the ultimate one pot meal, can be described as a 'Kohinoor'! The term 'Biryani' itself has the essence. Biryani can not be made in hurry and surely it can be perfected with lots of practice but is worth every bit of the effort. 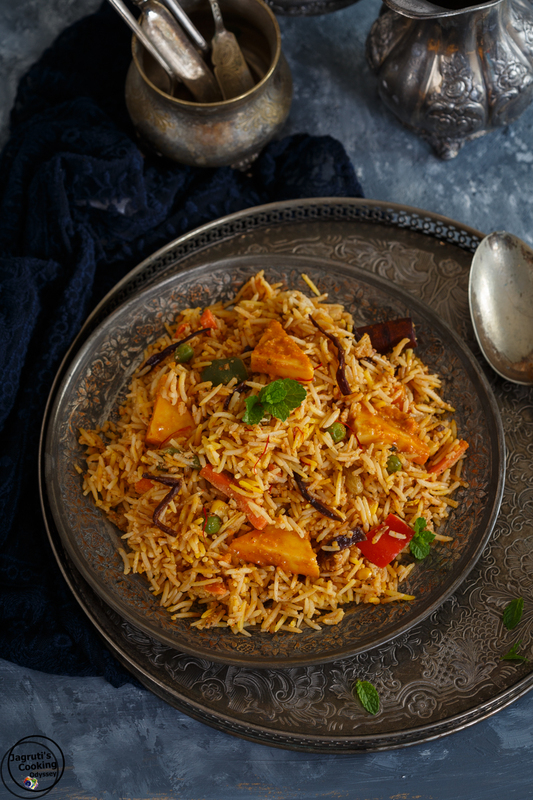 Long grain fluffy, fragrant rice, flavoured with beautiful and aromatic spice such as saffron is layered with meat or vegetables cooked in rich gravy. 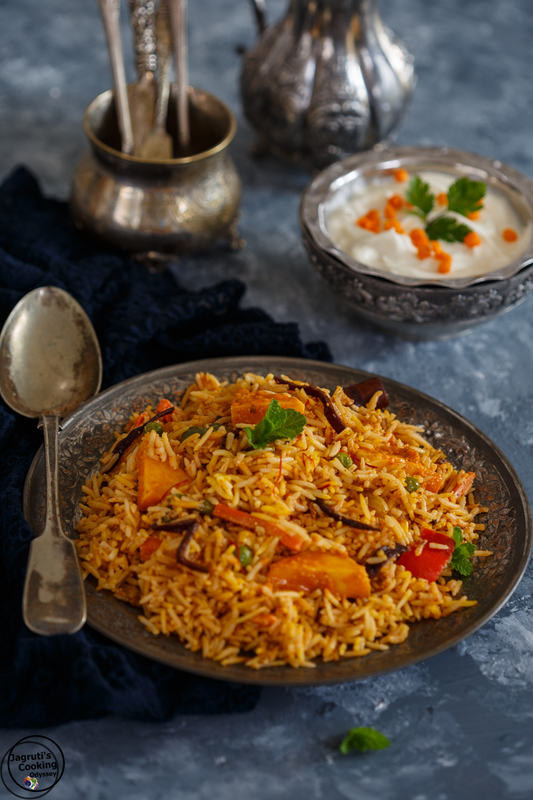 Biryani can suit anyone's palate as spicewise, biryani tends to be fairly delicate. In this recipe of mine, Paneer and assorted vegetables are cooked with spices, cream and nut pastes and that is layered with cooked long grained Sella Basmati Rice. A few weeks back I was reading one of the magazines and came across this article on wellbeing. Some experts found out that experience makes us happier than objects because the excitement of buying something fades faster than great memories. So next time you dip into your savings use them for a date night dinner, not a designer bag, which will probably go out of fashion before long anyway. So I took picture of this article and sent it to my daughter, and she sent me this reply "What makes you even happier is when you take your brand new designer handbag on a nice holiday." Well, she is daddy's little princess! So, did she buy a designer handbag or book any holiday? Well no, we couldn't book the holiday to Monte Carlo like she wanted for one reason or another. She said, "Ma, a designer handbag can be bought any other day, today let's prepare a Biryani together as that is a memory in itself". While I cooked the rice (my daughter should've prepared rice because she cooks rice perfectly, but we were using Sella Basmati Rice, I was fine to cook it myself) she prepared the Paneer and Vegetable Makhni. In just about, two hours we laid the yummy Biryani on the table with no hassle, and now we can't get enough of this masterpiece. Biryani turned out great and you tend to savour it even more when you know hard work has gone into making it. Sella Basmati Rice is available in most supermarkets as well as any Asian grocery shop. I like to use Sella for Biryani because this rice doesn't mush up quickly as normal basmati rice does. 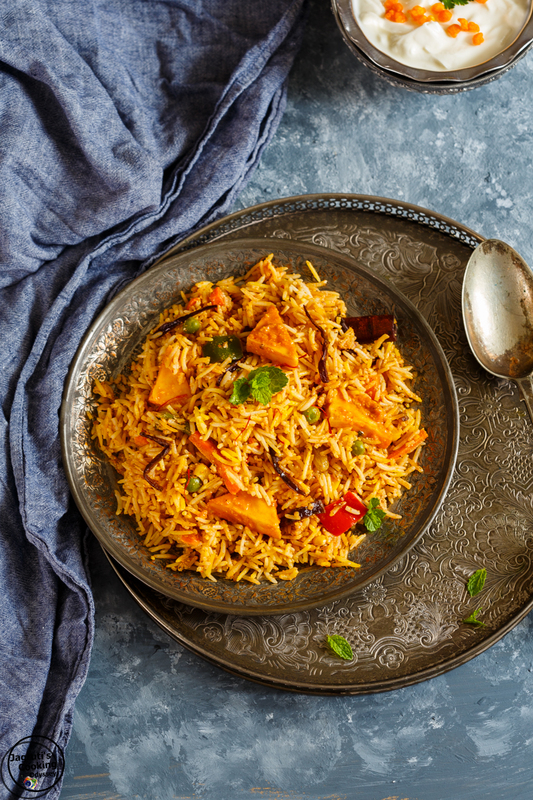 This Indian classic Paneer and Vegetable Makhni Dum Biryani is bursting with royal flavours. It is a treat to eat.All the aromatic and sweet spices, rich nuts and fats make the dish gratifyingly regal, as well as tasting exquisite.In this recipe of mine, Paneer and assorted vegetables are cooked with spices, cream and nut pastes and that is layered with cooked long grained Sella Basmati Rice. Soak saffron threads in lukewarm milk and leave it aside.Clean, wash and soak rice for at least for an hour in cold water.Meanwhile, make paneer and vegetable makhani.In a thick bottom pan or kadai heat oil or ghee.Add onion paste and cook for 5-6 minutes.Add ginger-garlic paste and cook for another 3-4 minutes.Then add red chilli powder along with all the masala and spice powder and cook for another 2 minutes.Now add almond and poppy seed paste and salt.Keep stirring, then add plain yoghurt and keep the heat very low.Add a couple of tbsp. water.Meanwhile, apply little oil or ghee on the paneer cubes and grill for 3-4 minutes on both sides.Add paneer and all the vegetables in the gravy.Mix gently then add cream and turn the heat off.Mix well and add kewra water and leave it aside.Now Prepare rice.In a large pan or pot add at least 2 LTR water, lemon juice, salt, ghee and whole spices.Once water starts boiling add soaked rice.Cook the rice until it's 75% done.Drain the excess water of the rice using a colander. Grease the heavy bottom pan with the little ghee.Now spread the 1/2 of paneer and vegetable makhani evenly.Add the 1/3 of rice on top of the makhani and spread it evenly, sprinkle cashews, sulatnas, some fried onions, mint leaves.Repeat with another layer of the remaining vegetables, the rest of the rice, cashews, raisins, fried onions and mint.Now pour saffron milk and remaining ghee on rice. Seal the pan with kitchen foil or pastry and cover with the lid.On a stove, first arrange a flat griddle or tawa , this will prevent rice sticking at the bottom.Put biryani pan on the griddle and keep heat high for 5 minutes.Then reduce the heat totally and cook the biryani for another 15-20 minutes. Once done, serve this Biryani hot with salad, raita and papad.Enjoy! I can imagine all those spices filling up the kitchen. This Biriyani looks absolutely incredible. I'm awed by the sheer volume of exotic ingredients you've listed. I wish we were closer, because I would totally bring wine and an appetizer if you would make this for me. Oh WOW! The flavours in this sound amazing and it looks like each ingredient works together perfectly. Count me in for this one! Thanks Joyce Lee :) Hope you make this. I don't make enough Indian food in my house! This looks like something my kids would love. All those flavors look delicious! Thanks Karen:) Please do try. What a beautiful looking dish! I love paneer and biryani but have never thought to combine the two. How delicious! I love biriyani and as you say the key to a perfect one is to have rice that cooks as separate grains.The colour is so vibrant. I love biryanis full of spices and veggies and the added treat is paneer. Cooking with my daughter is always a memorable event, time well spent bonding together in the kitchen. This sounds delicious. We love curries in this house, it's definitely made me hungry! This recipe sounds so good....I am loving those plates you found. They really help the rice dish stand out. This rice just sounds so delicious with all those spices. I can only imagine what your spice cabinet must look like. Mine is pretty full, but yours has to be off the charts! I love biriyani! I'll be trying this version soon! Gorgeous photos...this looks so good!! Very well written recipe. Would love to cook it soon. What a wonderful combination, Paneer Makhni and Biryani combined into one dish! Flavors must be awesome! Yum! The photos are so inviting... lovely Jagruti! Oh my goodness!! 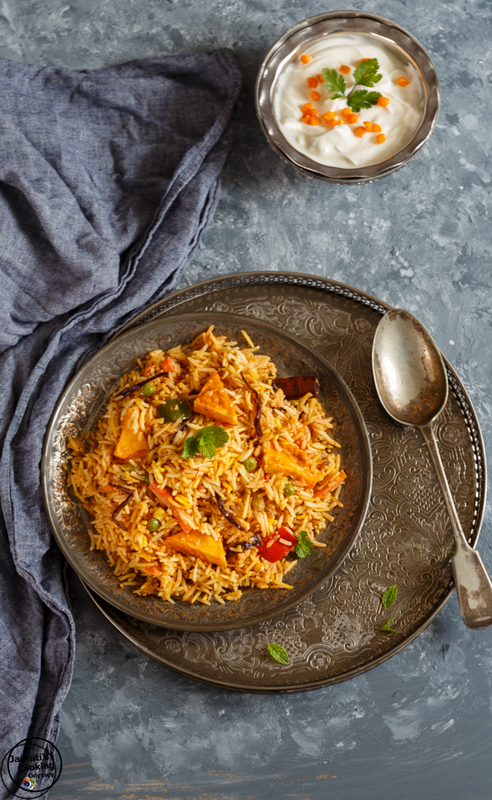 I love biryani and this recipe is a keeper for sure! Looks so tasty, nice clicks and the name too. Cooking as a family is always fun. Seems like you had a fun time. Amazing recipe and those props are really great. Looks rather delicious. I will have save this and try to make.